Pre-Requisites: Access Expert Level 29 strongly recommended, as you should watch all of my classes in order. However, if you're skipping around, you should have at least completed the Beginner series and the first 3 or 4 levels of the Expert series where I start to cover functions. This is part 6 of the Comprehensive Guide to Access Functions. We will be learning about the Financial Functions in today's class. Even if you don't have a job in banking or finance, you will still get a lot out of these lessons if you ever have to deal with money (and most of us do). We'll start out with a brief overview of the Access financial functions, what the various terms mean, and how interest is calculated (simple v. compound). We'll talk about annual percentage rates. Next we will build a Loan Calculator, and learn how to calculate the monthly payment for a loan, whether it's a 30-year home mortgage, or a 5-year auto loan. We will learn about the PMT function, and how to use the amount of the loan, the interest rate, and the number of years to determine the monthly (or any frequency) payment amount. For example, a $100,000 loan at 5% APR interest over 30 years gives you a monthly payment of about $536. We will build an Investment Calculator so we can calculate the future value of an investment with the FV function. If we know the initial amount of the investment, the interest rate, and the number of years we're planning on investing, the FV function can calculate the future value - the value the investment will have at that point in the future. For example, you want to put $1000 in a savings account earning 3% interest. What will be in your account in 10 years? Next we'll create an Interest Rate Calculator. This will allow us to figure out the ROI (Return on Investment) for any of our endeavors using the RATE function. For example, you invested $10,000 in a friend's business 3 years ago, and he wants to buy you out for $15,000 now. That turns out to be a return of about 14%, so it's a good deal. Next is one of my favorites, the Millionaire Calculator. This uses the NPER function to how long it will take your investment to reach a particular value. For example, you're planning for retirement and you figure you're going to need $100,000 to retire comfortably. You know you can easily set aside $1,000 each month in a savings account earning 5% interest. the NPER function will tell you that it will take you about 7 years to reach your goal. You can also use it to see how long it will take you to become a millionaire, given how much you're able to save each month. It's fun. Try it. We will create an Initial Deposit Calculator. This one is good for determining how much you need to put away now to reach a specific goal in the future. This is great for determining how much to save for your kids' college funds. For example, let's say you know that you're going to need $50,000 to put your kids through school, and they're going to start college in 15 years. Your bank has a bond you can buy at a 5.75% APR. So, you can use the PV function to figure out that you need to invest $18,277 now to have that $50,000 in 15 years. The PV function can also calculate the value if there are extra monthly payments thrown in - so you could start with $15,000 and then add in $250 per month if you want. Next is the House Value Calculator. This is a great calculator to use when you want to figure out how expensive of a house (or car, or boat, or whatever) you can buy. You know how much you can afford for your monthly mortgage payment. You know you want a 30 year mortgage. You know the bank is offering you a 7% APR interest rate. You can use the PV function to determine that you can afford a house value of $300,615. Finally, we're going to spend some time learning the basics of Loan Amortization. We already know how to use the PMT function to calculate the monthly payment for a loan. With the IPMT and PPMT functions we can calculate how much of that payment is going towards interest and principal, respectively. 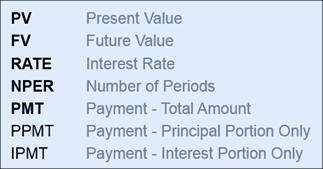 We can see what the principal balance of our loan is going to be after any point in the payment schedule. So, for example, after paying off your home loan for 15 years, you can see what your "payoff amount" would be. I have a separate Loan Amortization Seminar which goes into much more specific examples, but this is a great introduction to the concept for non-financial professionals. This is the 30th class in the Access Expert series. This is the 6th class in my Comprehensive Function Guide series. If you're serious about building quality databases with Access, and you have any interest AT ALL in financial functions, don't miss out on this course. Of course, if you have any questions about whether or not this class is for you, please contact me.